I make them my way. I like them crispy and golden and salty and slathered with sour cream and something sweet. On a mandoline, set to extremely thin, slice the onions, then chop them with a knife to break up the the rings. Place onions in a large bowl and mix in 1 tablespoon of kosher salt. In a food processor, fitted with the grater blade, grate the potatoes. Mix the potatoes with the onions. Taste the potatoes and add more salt if necessary. Allow mixture to sit for 15 minutes. Thoroughly wring out potato onion mixture in a cheesecloth, over a new bowl to remove all the moisture. In the bottom of the original bowl you will see water. Carefully strain the water so you keep the potato starch that has gathered in the bottom of the bowl. Beat the eggs with the potato starch. Mix the potato-onion mixture back into the eggs. Preheat oven to 250° and place a sheet pan in the oven. Have a paper towel lined platter near the sink. Heat 1/2” of fat-oil in a heavy skillet over medium heat. Spoon tablespoons of the latke mixture into the oil. Fry the latkes on one side until golden brown, then flip them over with a spatula and brown the other side. Place latkes on paper towel lined platter, then transfer them to the oven. 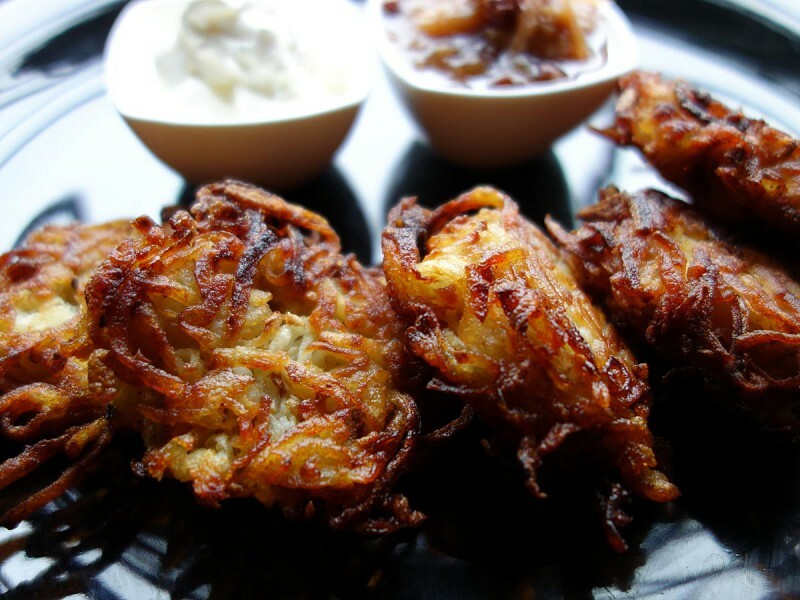 Enjoy latkes with sour cream, apple sauce or your favorite chutney.